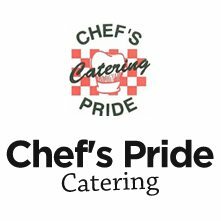 Stations $40.00 Service Package – Chef's Pride Catering, Inc.
Price $40.00 per guest with a minimum guarantee of 100 guests. Price $45.00 per guest with a minimum guarantee of 75 guests. Price $50.00 per guest with a minimum guarantee of 50 guests. Served with choice of three dressings: Ranch, Cherry balsamic vinaigrette, Poppy seed, Cajun buttermilk, Italian, White French, Balsamic vinaigrette,1000 Islands.